A: You confirmed your position as one of the top European dance teams this season at the European Championships. What does the good result at Europeans mean to you especially since you had a tough start to the season because of injuries? Penny: It means a lot. I mean, going into a big competition where there are so many strong couples you never know where you're going to come. And so Nick and I just try to go out there and skate our best and, you know, like the question says, we weren't ready for the other competitions we had done earlier in the season, but we both felt like we had trained really hard and worked hard and we felt good going into Europeans. So we just wanted to go out there and show our programs off as good as they can be and just skate well, which we're really happy that we did that. And I think when you do do that then the placement does go up. Nick: I think having a good result at Europeans gave us a lot of confidence. Because, with a tough start into the season...that's not best for the confidence and then you go into European championships and you don't know where you'll be. So, but now, you know, it gives us confidence that we can use in training for the World championships. Q: Your lifts always stand out. How do you create these lifts and make them look so effortless? Penny : I think we both sort of have a figure skating obsessive compulsive. You know, all we're doing is watching videos and writing things down, thinking of ideas... from anybody. From acrobats, from ballets, from shows, from dances... We try and look and find different things and think "Ok, can we put that on the ice?". And we always have so many ideas, some of the times we can't always put them all on the ice. We have even now some lifts on the back of our minds for next year, we weren't able to put them into the program this year because of injury, but we're hoping to do that next year and we're really excited about them. Nick: Yeah, we're always looking and always thinking of ideas what haven't people done before. And what makes it easy and effortless is that Penny is small. (Penny laughs) So that's why they look easy. (laughs) I have an easy job. Q: Which ice dancers did you look up when you were younger and why? Nick: Well, huge ones are Torvill and Dean from England. 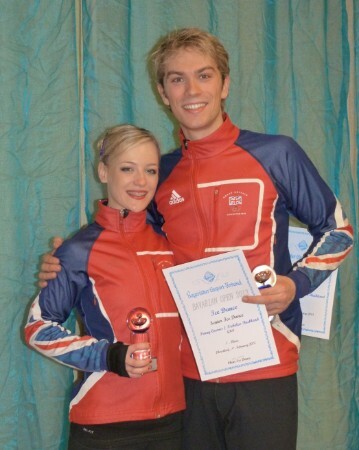 Everybody loves Torvill and Dean and people always talk about them and they ask "Are you the new Torvill and Dean?" in England. Yeah, people want to know.. so yeah, we look up to them and learn from their ideas. Also Evgeni (Platov), our coach, he achieved so much, is such an amazing skater. So he is a big idol of ours, I think. Penny : We actually watched a video from Evgeni when he was just sixteen years old. He showed it to us yesterday. And even then he was just so clean. I mean, you know, skating has evolved from then, but he was just sooo clean and that is something in Evgeni that you definitely look up to and again Torvill and Dean are like that, also. For me, when I was younger, I also looked up to Albena Denkova and Maxim Staviski. I just loved their power across the ice. You know, they're not the tallest couple in the world and obviously I'm no biggie myself, but the skating skills and how much power they've got, that was good. Q: How is it to work with Evgeni Platov, a two-time Olympic Champion? Nick : Uhm...very good. We really enjoy it. (Penny laughs) He's very experienced. He's been there and has done everything. You know, all situations, he's been there... So if you're having a hard time, troubles or are nervous, he can give you advise. He's also amazing at teaching basic skating skills. So we really love the time in the off-season in the summer and just work on basic skating, like...no programs, just learning how to skate again. And every year that happens and that's why I feel we keep improving this season. Penny : He's such a good mentor and in training and you're doing your run-throughs he does them with you. I don't know if that makes so much sense, but it's the same in competitions, too. His energy is there with us. He's such a huge inspiration, because of everything that he has achived himself and so we feel like we can learn so much from him. And what Nick said, he's experienced everything so that makes him really relateable as a coach. And he's also very very good at teaching tecnique. Another thing is, when you're training and you're not feeling so good, he knows when to push you and when not to push you. And sometimes he makes us do things that if he had told us before the sessions "We will do this, this and this." I would be like "No way! ", but, we do it. And that's what he's good at, very very good. Q: What points you are focusing on in training before Worlds? Nick: I think we're trying to make the programs look stronger and stronger and stronger. I think we got them to a stage for Europeans where we felt they were good, but now we can push them to achieve even more. We got some good levels. We can work on some areas for the levels too, but mainly pushing the programs to make them stronger. Penny: Yeah, I think what we can take from Europeans is that we got good levels, but there is always room to improve. Even if we got a good level on something, the GOE can always go up. So it's just finishing and trying to get stronger skating skills and things like that within the program. Q: Where do you see your strong points and your weak points? Nick : I think our strong point is that we always try to do intresting programs that people enjoy to watch. And I think if the crowd kind of gets behind them and they're recieved well the judges will mark you better. So I always want to try to do something that's going to interest the people. And weak points... I guess that would be the skating skills. We've grown up seeing the Russians and how strong they are as skaters and you need that to get higher and higher and higher. And also the Canadians and Americans, so that is something we are working on with Evgeni. Q: British ice dance has a long tradition and in the past few years the ice dancers have been the most successful British skaters with the Kerrs and now you. How much pressure does this put on you? Penny: I don't know... I don't really see it as pressure, it's more like a challenge. Torvill and Dean did so well so many years ago, and then for us a couple of years ago to train with Sinead and John and to see what they achieved. That kind of opens your eyes and think actually those medals are possible and getting up to the top is possible. And for me it's game on, I want to get there too and do what the Kerrs did and maybe even there. So I don't really see it as pressure. Nick :Yeah, I think, ever since being a little boy I always wanted to win medals and do well. So it's no difference because the Kerrs were there or Torvill and Dean were there, I wanted to do that anyway so it's my chance now. Q: How do you think skating can become more popular again in Great Britain? Penny: ...yeah, I think, the better, for example, the better we do, the more exposure we will get and then hopefully the more popular the sport will get. I think the good thing about ice dance is there is a history of Torvill and Dean and Nick and I are from Nottingham as well, which is where they are from. We just have to keep on working and hopefully the British people will tune in. Nick : And fall in love with ice dancing again. Q: Nick’s younger brother is an ice dancer as well, still in the junior ranks, but one day he’ll move up to the senior level and will compete against you. How do you feel about that? Nick: I'm kind of proud that me and my brother both train and compete on a high level. So I'm looking forward to that. We train together, a lot of the time, with Evgeni as well, so we push each other every day.